Now we leart how to make a fast scroll in listView. *DividerItemDecoration (it divides our item). As per Android Documentaion recyclerview is the new way to organize the items in listview and to be displayed horizontally. * Created by javierg on 16/02/16. Now We have our horizontal ListView. You do not have to do anything special in layout.xml file nor handle anything on the parent ScrollView. You only have to handle the child ListView. You can also use this code to use any type of child view inside a ScrollView & perform Touch operations. 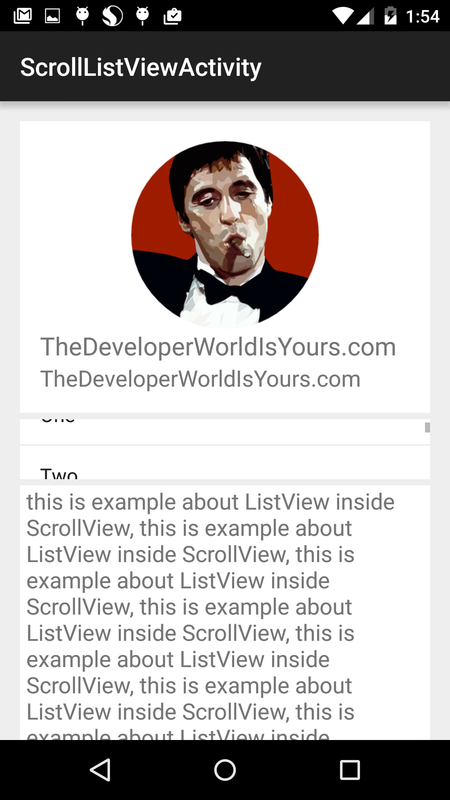 Today we’ll show you how to create a list view inside a scrollview in android. It’s very easy as you will see in the example below. You can directly download the code of follow the steps of our tutorial.